Savvy Spending: HOT Deal on K-Cups! Stock up and get Victor Allen K Cups for just 15¢ each! HOT Deal on K-Cups! 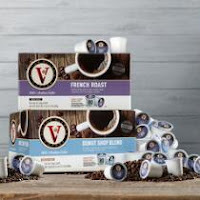 Stock up and get Victor Allen K Cups for just 15¢ each! You can get an AMAZING deal on K Cups! The Christmas Tree Shop has their Victor Allen Coffee Pods 80 ct pack for just $15.99! Plus you can save $15 off a $50 order AND get free shipping with a $65 order with a coupon code! So if you can stock up on these K Cups, you can get a HOT Deal! First, start at Top Cash Back for 4% cash back. Type in Christmas Tree Shop and click their link. Final cost only $62.35 shipped for 400 pods – just 15¢ per pod delivered to your door! This deal is valid today only!